Back in 2008, the U.S. Department of Energy recognized Milwaukee as a budding leader in the movement to promote solar power at the local level. Nearly a decade later, the city’s success in promoting solar remains handcuffed by an investor-owned utility fighting progress in favor of the status quo. 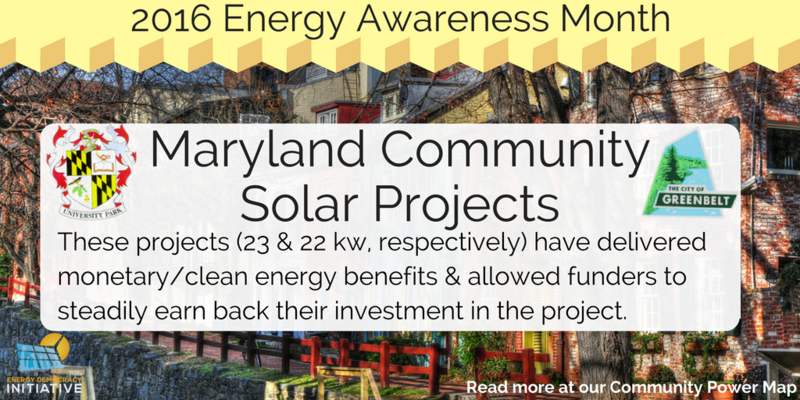 This is part of a series released in October 2016 for Energy Awareness Month highlighting communities and community energy projects on ILSR’s Community Power Map. It’s not that Milwaukee hasn’t made headway in its comprehensive, citywide plan to boost solar capacity. Milwaukee Shines, a solar-focused initiative housed within the city’s Environmental Collaboration Office, has championed novel approaches to financing, adapted city policies, and forged partnerships with community groups. 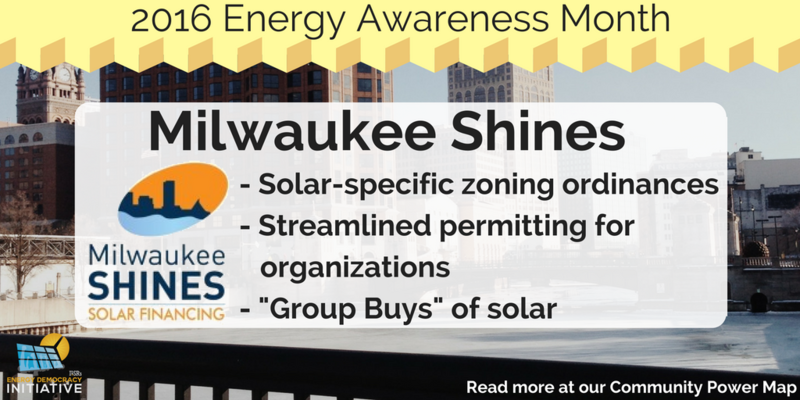 Most notably, Milwaukee Shines spearheaded a solar-specific zoning ordinance and streamlined permitting for solar installations. It also coordinates “group buys” that allow more people to buy in at a lower cost — efforts seeded with federal funding that have brought more than 1.5 MW of solar capacity to Wisconsin’s main metropolis. Still, in a city with a population around 600,000, that’s not saying much for solar penetration. The relatively low solar capacity built to date hints at tensions between We Energies, the utility serving the area, and solar proponents like the city of Milwaukee. Distributed generation, such as rooftop solar, threatens We Energies’ antiquated profit drivers: electricity sales volume, and the construction of new power plants. Under We Energies’ clean energy program, customers must pay a premium to cover their electricity usage with renewables — this, despite the fact that wind is abundant in the Midwest and the cheapest form of new power generation. The utility’s reluctance to adapt to an evolving marketplace has bled into Wisconsin’s regulatory regime. We Energies scored big in the fight over Milwaukee’s energy future when it notched approval in 2014 for a dramatic across-the-board fixed charge increase. Utilities nationwide have tested the tactic to limit the appeal of rooftop solar, relying on rhetoric rather than facts to make their case. With regulators’ go-ahead, We Energies’ hiked 1.1 million customers’ fixed charges by 75%, from $9 to $16 per month. The measure was a direct hit to solar growth in the state, adding new costs that complicate the financial feasibility of installing rooftop panels. A marathon public hearing on the We Energies plan drew hours of testimony from pro-solar residents. But despite the outcry, Wisconsin at the time stood alone as the only state whose regulators had supported a rate restructuring proposal designed to sideline solar. We Energies attempted to take its opposition a step further with a surcharge targeted at solar customers, a bid to bite deeper into the financial benefits of renewables. That plan would have required residential solar customers to pay a $3.79-per-kilowatt demand charge each month, and add a charge for a second meter. For a rooftop solar customer with a 5 kilowatt array, producing 6,000 kilowatt hours per year, the fee would cut savings by nearly 30%. Such systems would net around $582 per year with the demand charge factored in, down from $810 without it. We Energies also pushed to ban third-party financing and leasing options for new installations, chipping away at the benefits of distributed generation. In a win for Wisconsin solar, the solar-specific provisions were ultimately struck down. Still, the sharp divide between the local electric utility and groups like Milwaukee Shines — dedicated to capturing the economic and environmental benefits of renewable energy — obscures the city’s potential for substantial solar growth. The struggle persists even amid sustained enthusiasm for rooftop solar. 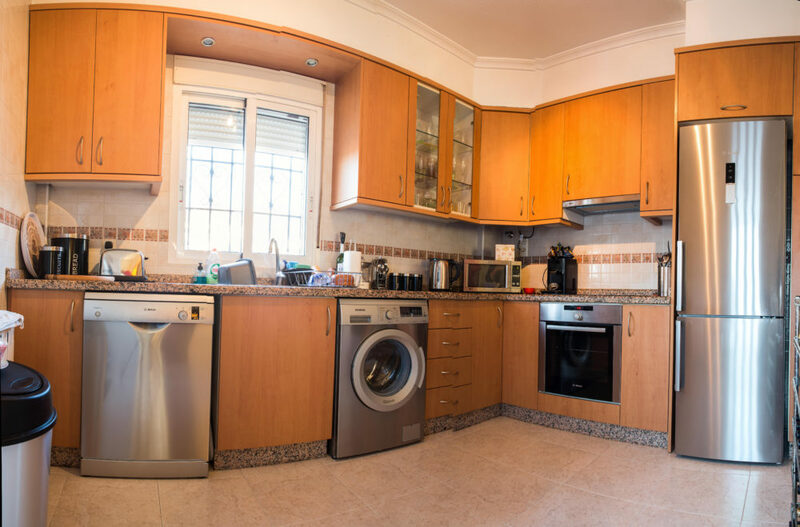 The opportunity for bulk purchasing is a significant contributor to the success to date, and continues to draw interest from area residents. Under the Milwaukee Shines model, supported also by the Midwest Renewable Energy Association, property owners clustered in a given area can opt into solar alongside their neighbors. By buying as a group, they guarantee a single solar contractor a larger amount of work in exchange for a lower installation price. City officials have jokingly called it the “Costco method,” noting that it focuses on larger-scale solar gains across the community, rather than at individual locations. The framework shaved about 20 percent of installation costs for Quintin Bendixen, who lives in Milwaukee’s Bay View neighborhood, recently told Wisconsin Public Radio. After years spent running the numbers, he credited the program — along with sinking solar costs in general — for making it financially feasible to mount rooftop panels on his 1,100-square-foot home. Mike O’Connor, a landlord that recently installed 96 solar panels atop his five-story story apartment building, told the radio station his primary motivation was financial — over time, solar panels will save him money and pay for themselves. It’s a message he said he hopes other property owners will latch onto. So far, the group buys have brought 322 kilowatts of solar power to 92 homes and businesses spread between four neighborhoods, according to the city. Going forward, Milwaukee Shines and its partners will continue to target specific corners of the city, though the bulk-buy program is open to residents across southeastern Wisconsin. In addition to directly linking customers with solar equipment and contractors, Milwaukee Shines has helped develop favorable financing that makes the installations easier for more people. A public-private partnership with Summit Credit Union, a local lender, offers ready-made packages for Milwaukee property owners looking to capture the long-term cost savings of solar. Eligible borrowers — people who one one- to three-unit homes that they also live in — can secure up to $20,000 in low-interest financing to cover equipment, labor, permits and interconnection fees tied to their solar project. Repayment plans extend up to 15 years. The partnership has $2 million to pour into the cause. But with most homeowners paying between $3 and $4 per watt to install rooftop solar, that’s only enough add between 500 and about 660 kilowatts — a helpful boost, but not enough to make big waves in Milwaukee’s energy economy. Solar projects flesh out Milwaukee’s expanding renewables portfolio, which also includes a wind turbine. The city’s less conventional approaches include a “solar flower,” whose six panels act as public art as much as they power stalls at the city’s farmers market. Milwaukee students have also participated in a citywide program, hosted by Milwaukee Shines, to design solar projects for their schools. To learn more about the national movement toward distributed generation and renewables, visit ILSR’s interactive Community Power Map. The tool showcases programming, policies and projects across the U.S., and compares state-by-state performance. Bookmark it and check back for updates. This article originally posted at ilsr.org. For timely updates, follow John Farrell on Twitter or get the Energy Democracy weekly update. 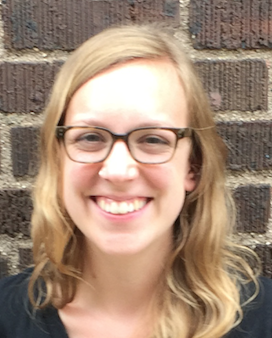 Karlee Weinmann was a research associate for ILSR’s Energy Democracy initiative. She produced reports that spotlighted best practices in an evolving energy economy.